Rated 2 out of 5 by unhappygenraccustomer from Beware it could be delivered with a defective battery I purchased a GP8000E and paid extra for the electric start. I started it when it first arrived to ensure all was OK. It started right up. 8 weeks later I went to exercise it and the electric start would not work. I took it to a factory authorized service center where they discovered the battery was defective. It would not charge nor hold a charge. They replaced it and it started immediately and now runs fine. THE PROBLEM....This generator cost over a thousand dollars, is brand new with 12 minutes run time on it, YES 12 MINUTES. The generator was delivered to me with that defective battery and Generac WILL NOT COVER IT UNDER WARRANTY!! I cannot say enough good about ELECTRIC GENERATORS DIRECT which is who I purchased it from as they are a Generac Distributor. They stepped up BIG TIME once they were told what happened and THEY took care of this repair. Fabulous customer understanding and support by ELECTRIC GENERATORS DIRECT. Generac..not so much. This is a major purchase for most. Hope it runs and lasts longer than the factory supplied battery! 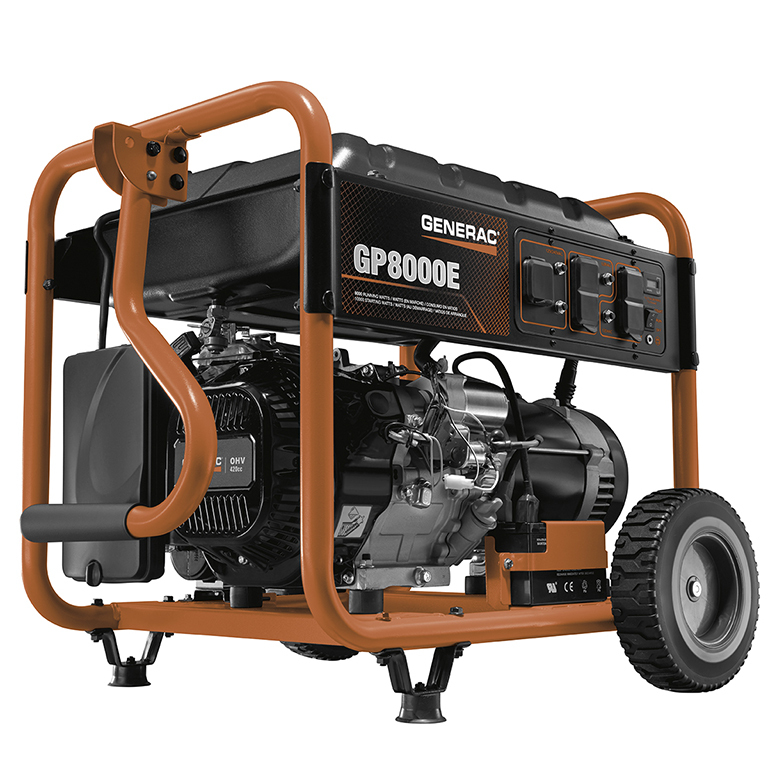 Rated 5 out of 5 by JimmyVern from Quality Is Number 1 I purchased the Generac GP8000E after doing alot of research with several other brands. I am not disappointed, from the moment I started to unpack the generator I noticed the quality of the packaging, which gave me confidence in the product right off the bat. The engineering made assembly very easy! You notice the quality in every part as you put this baby together. The quality shows that Generac and its associates genuinely care about the product they put out to the consumer. Rated 5 out of 5 by George from Great Value Just assembled, Very easy. Simple instructions. Started immediately. Still have to connect to main panel. Rated 5 out of 5 by Sandy from Easy to run Easy to use. Love it! Runs my whole house. Lights, refrigerator, furnace, well pump.. my house is 1700 sq ft. Only complaint is the gas gauge gets condensation which makes it hard to read how much fuel you have. Wish I bought it years ago!!! Rated 5 out of 5 by Rich from Easy to assemble, great sturdy quality, and started on the first try I have been wanting and researching a potable generator for years. With this, the generac name continued to rise to the top in quality and performance. Then came an immediate need, and after looking at my options I decided to go with generac. Even though the decision called for a quick decision I was confident that I was making the best decision. I found what I was looking for at Lowe’s and actually upgraded from a 6500 to the 8000, the price was right and it came with an electric start. I brought it home and within 2 hrs had it making electricity! The ONLY down side of the whole situation was that they advertised that it with idle control and it turned out it didn’t. Please correct this. I give this product two thumbs up! Rated 5 out of 5 by dave50 from Perfect Portable to run the house Three quotes of average 6500.00 to set up a house generator. This was a great choice. although it won't automatically start when power goes out. We can plug this in and power our whole panel, then just be careful on what you use. total cost plus the hiring af electrician 1600.00. Simple box switch. Perfect solution for us. Rated 5 out of 5 by Rjcymbal from This product is amazing!! This generator rubs my whole house! Including my well and electric water heater! I am just simply impressed! Rated 5 out of 5 by Steve from GP8000E Product is an excellent buy compared to other competitive products. Easy to operate and can be moved without any difficulty. I would recommend this product to others who do not want to spend for a outside permanent generator. GP8000E is rated 4.8 out of 5 by 101.